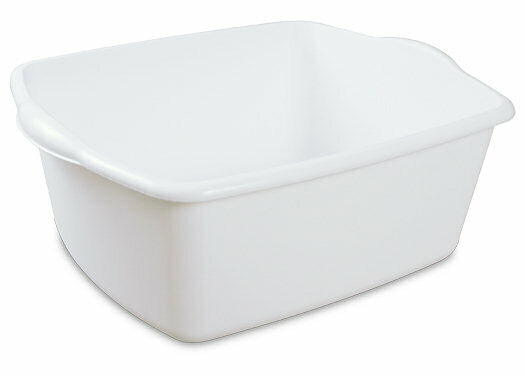 The 18 Quart Dishpan is ideal for a variety of basic household needs. It's large option is ideal for kitchens or family sized camping trips. It is designed with a rectangular shape and a modern design that is easy to clean. 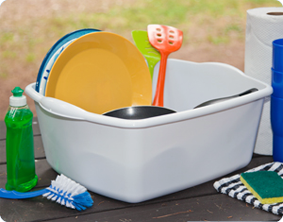 The dishpan fits comfortably in a standard double sink and allows to expand your space with more washing and soaking room. Two handles are molded into the side for comfortable, easy lifting and transporting. The plastic, non-porous container is durable and useful for many household tasks such as soaking dishes, washing small toys, cleaning delicate clothing and storing items in a cabinet or pantry. 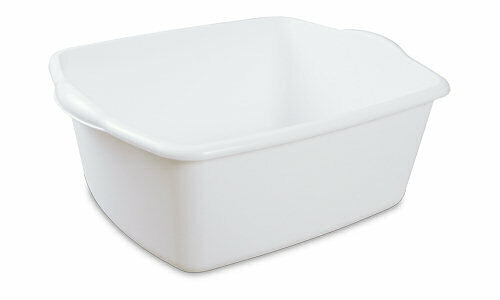 The overall dimensions of this item are 17 1/2" L x 14 1/4" W x 7" H.
Ideal for washing dishes while camping. 18 Quart Dishpan is rated 2.0 out of 5 by 5. Rated 1 out of 5 by Spida from Cannot use for intended purpose I am one of those odd ducks, I still do dishes, delicate items and other hand washable items by hand. Not being able to find Sterilite's major 'R' competitor in stores any longer, I purchased an 18-qt dishpan to replace my 10-yr old 'R' counterpart. The first time I filled it half full with water and wool socks for washing, it cracked when I lifted it our of the sink to remove the soapy water to add fresh for rinsing. Sadly, I purchased three of these that day along with two smaller ones. The upper rims and the handles just aren't thick and sturdy enough. Rated 5 out of 5 by grebet from excellent product i have had mine for 3 yrs wash dishes 2 to 3 times a day. it just now started to crack on side rails. i did not expect it to last this long. i still use it. just looking for prices. Rated 2 out of 5 by QL Fifi from It's broken already! I purchased the dishpan with reinforced handles exactly one week ago today. I've been using it once daily filling it with 1 gallon of warm water only. Disappointing. Rated 1 out of 5 by Very Disappointed from Do Not Use With Water I'm serious, you cannot use these dishpans to hold anything heavy, like water. As soon as you pick it up to empty the water out the problems will start. The bowl flexes. Over time - depending on how often you do the dishes - the flexing will cause cracks at the weakest point; the handles. Another couple of days and the cracks turn into rips and the pan is useless. I wash dishes two or three times a day. At this rate one of these dish pans lasts about three weeks. Are they meant to be disposable dishpans? Are they only meant to last a few weeks? If so, Sterilite should market them as such and bring the price down because its an expensive way to do the washing up. And think of all this plastic being discarded; I suspect I am not alone in having trouble with Sterilite products longevity, and I also suspect I'm in the minority of people who recycles plastic instead of just chucking it in the landfill. Open your eyes, Sterilite. Rated 1 out of 5 by DianaS from flimsy and disappointing The second time I used this the side cracked right at the edge of one of the handles. I used it for a couple of weeks and then replaced it with another of the same kind. This one lasted less than a month before it cracked in the same spot. Today I returned to the store to replace it yet again -- and the only one they had in stock already had a crack in the same place! The description claims they are tough and durable - I say save your money!